Anybody who owns an Indigo2 will tell you that they have one of the finest graphical workstations ever built. And it isn't totally obsolete yet either, as the Indigo2 can still hold it's own against more modern machines, thanks to an upgradable architecture that can, in some cases, allow the machine to use the powerful R10000 processor, the same CPU used in the much newer (and much more expensive) SGI OCTANE machines, which high-end places like Pixar and Lucasfilm still use. And I still see Indigo2's in use all over, particularly during bad weather, when the local news brings us to the weatherman in the "weathercenter", who is normally modeling the bad weather on this type machine. 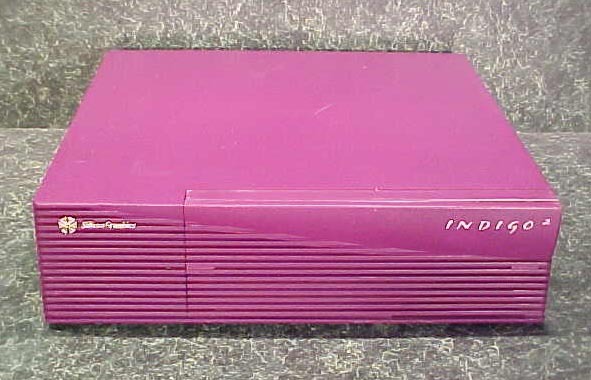 The Indigo2 was positioned in the middle of the SGI lineup, between the low-priced "Indy" workstations, and the much more expensive servers such as the "Onyx". As such, it needed to fill the tough role of being somewhere between those two extremes. This was done by making the machine very expandable, so that many options could be added for a variety of configurations. In my opinion, though it's not as "pretty" as the original Indigo (I mean come-on, it's big rectangular box), it's an extremely capable and very powerful machine - and a worthy successor to the Indigo name. One of the reasons the Indigo2 is so large (18.5 inches wide, 18.5 inches deep and about 5 inches tall), is the incredible expandability of it -- seen in this first image is the flip down door, revealing two bays, a 5.25 "half-height" bay usually for a CDROM drive (although I've seen some with the old 44MB Syquest drives as well), and a second 3.5 inch drive bay. I say second because the first 3.5 inch drive bay is BELOW the one you can see, hidden behind this front faceplate. So, here is the faceplate removed and you can now see the lower bay, which normally contains the boot drive. The upper bay can be used for an additional 3.5 inch drive, but can also be used for a floppy, floptical, DAT drive, or any 3.5 inch device that might require you to access it behind the door. Also note that to the left of the 5.25 bay are two round holes. The larger hole is part of the on/off switch (the rounded-edged square button in the first photo). The second hole is the emergency "reset" switch should the machine lockup for any reason. With the faceplate off, you'll now notice two other tabs in the lower portion of either end of the exposed area. This allows you to get the whole top "skin" off the machine so you may access all the internals of the machine. Now that we've got the top off, one of the first things that'll strike you is the angled placement of the fan in the left-hand corner. It's that way for a very important reason. By drawing air across diagonally, it dissipates heat not only from the card cage, on the far left, but also from the CPU, which is located right underneath the 5.25 drive bay, in the center of the machine. Combined with the second fan inside the power supply, the machine generates a healthy internal breeze -- this may be the first machine I've ever owned where I didn't feel the need to hack in some extra fans!! 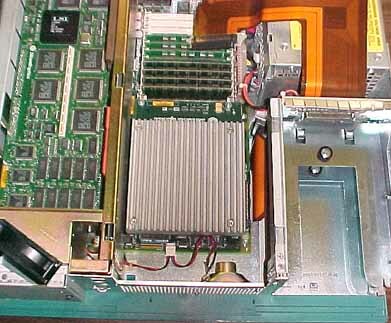 Each peripheral that is plugged into a particular drive bay must use a special "drive sled" that plugs it into the proprietary connectors for the SCSI bus. Similar to SCA, but just a little different, it provides the SCSI bus, power connection and SCSI ID all in one single connection. That brown plastic flat ribbon is the internal SCSI cabling. The one and only card currently plugged into the card cage on this machine provides the X/Z (GR-3) graphics. With 4 geometry engines, it's actually very similar to Elan Graphics, but with a different name. There's a link to explain how this came to be, but essentially, X/Z graphics started out as 2 geometry engines (GR-2), and later, SGI added 2 more for the same price as the GE's became cheaper to manufacture. Looking down into the cardcage now, you'll see the RAM SIMMs at the top of this photo. Depending upon the model CPU the machine is equipped with, the Indigo2 can address either a maximum of 384MB or 640MB of RAM. The RAM is in three banks of 4 SIMMs each. In this image, bank 3 is empty. Now, let's look a little closer at the card cage. 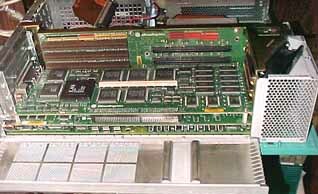 The Indigo2 is unique among all of the SGI machines I know of because it can use two different types of cards within the card cage. 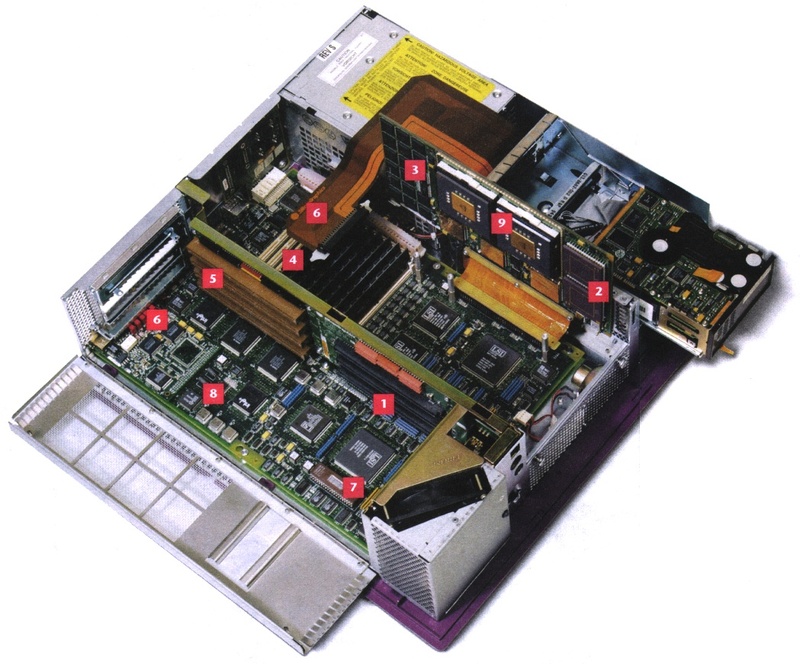 The first are the proprietary SGI GIO slots, such as the X/Z graphics card that's in there. These are the black connectors within the card cage. However, there are also these brown connectors more towards the rear. These are to make use of cheaper, more standard ISA/EISA "PC" style cards. SGI was hoping that card manufactures would take advantage of this and write drivers for IRIX to make use of the plethora of cards on the market for PC's. Unfortunately, I don't currently even know if any such cards were ever made ot make use of the ISA slots. We've now circled around to the rear of the machine where the business end of things are. There are a variety of connectors for keyboard, mouse, serial, etc. Incidentally, the Indigo2 can make use of "standard" 101-key keyboards from PC's (as long as they use the mini-din "ps/2" style connector). Similarly, they can also use PC mice as well, but you need to find a 3 button variety to really get all the features of Unix/X-Windows. From here, you get a slightly better view of the RAM as well. Bank 1 goes partially underneath the 5.25 inch bay, so to initially install RAM into the machine, you'll need to disassemble it more than you see here. If you scroll back up to the first image with the top completely off, you'll see two screws on either end of the front of the 5.25 bay. Loosen and remove those screws, but careful, they are on springs and might pop out! From there, you'll need to disconnect the SCSI bus connection by moving two simple spring-clips. After that, push gently back on the whole 5.25 tray and it should slide backwards and the steel tabs that secured it to the chassis should come free, allowing you to remove the entire 5.25 bay. So, here it is underneath the 5.25 inch bay -- the damn biggest heatsink you'll ever see covering the 200Mhz MIPS R4400 CPU. A couple of important things to note from this image. 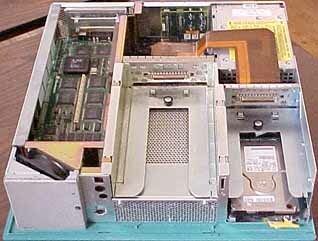 The first is that the brown SCSI ribbon is detached from the 5.25 drive bay near the top of the photo. However, after it passes through the two 3.5 inch drive bays, it ends up attaching to the motherboard to the immediate right of the heatsink. It's important to note that it's relatively easy for the connection here to become loose or even detach entirely, and this could cause the machine to act "dead" and not boot. 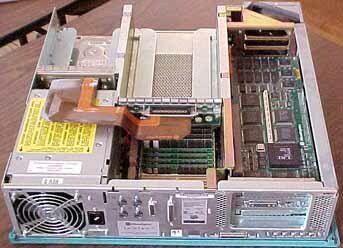 If you don't see a SCSI drive from the PROM monitor while doing the HINV command, the SCSI bus may not be attached to the motherboard. The other thing to notice in this image is that just to left of the speaker attached to that front grill is space to hack in an extra fan! D'oh! I'm incorrigible! My last image for this page is a look down the card cage with the side removed. From here, you get a better look at both the GIO slots and the EISA slots and you get to see that the X/Z graphics card is really TWO cards sandwiched together. Despite this, I still have two slots free. Because of where the GIO card sits, I cannot use the closest EISA slot (closest to the motherboard, that is..). Those of you who have looked at PC motherboards that share a slot between PCI and ISA know this story well. Just because the slots are there doesn't mean you can actually use them all. Since there is some confusion about X/Z and "Elan" graphics cards, let me try and clear up the confusion. THIS LINK should clear up the confusion. Another question has been about the color -- there are two different Indigo2's, the "teal" colored ones, like this one, and the Purple ones. Teal machines were either R4000 or R4400 equipped with entry to X/Z graphics options available. The Purple ones were the R8k and R10k cpus, and had the IMPACT series graphics cards (Impact, Solid Impact, and Max Impact). So much to say and so little space! The Indigo2 Specs and Product Info - Courtesy of FutureTech Research. A Picture of an Indigo2 Impact System. These are the Purple case machines, and much more desireable than the Blue-Green machines, because they are the R8000 and R10000 capable machines with the ability to run the IMPACT Graphics Boards. A View Inside Indigo2 Impact System. 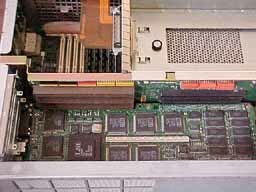 Note the R8000 card where the R4k would normally plug in (photo shows the card tilted up against the 3.5 drive bays). Beware, this is a large (314k) image. This part of ObsolYte! wouldn't have been possible without the help of the folks at Reputable and Greg Douglas in particular. Reputable donated this machine towards this effort and my sincere thanks go out to them (and him) for helping to make this possible. Other thanks go out to Christian Liendo, Barry Einstein and Brad Bidnick for helping me gather info for this page and getting the machine up and running.